We have taken the guess work out of getting the most bang for your $$. We have rebuilt tons of customer engines over the years that were all wrong and had parts that didn’t work together. 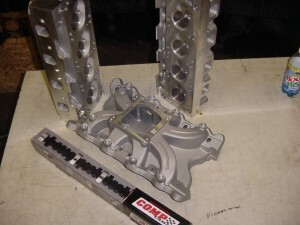 Examples race camshaft and torque intake, or stock heads with a tall single plane intake manifold. These parts don’t work together! We have built and dynoed over the last 20 years lots of different combinations and have given you access to that knowledge now. Our power kits are based of engines we have done in the past. These kit give you the basic parts that really take experience to make a engine work great for your specific application. Remember we design custom kits too! 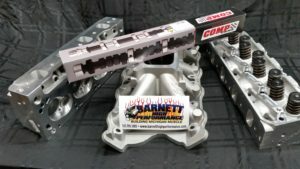 Fill out a custom engine quote form and we will get a kit priced for you. 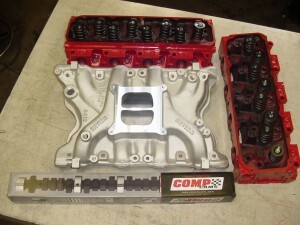 All kits consist of assembled heads, intake manifold and camshaft. Your order will be produced and shipped within 2 to 4 weeks. 1 Customer must return Warranty slip with installers info within 60 days. 2 BHP expressly excludes any implied warranties including but not limited to any warranties for fitness for a particular purpose or merchantability. The warranty set forth in this agreement is the sole and exclusive warranty given to Customer and does not extend to anyone other then the purchaser. 3 Your warranty will be voided if any of the following happens! It is used for racing. 4 BHP will charge a 30% restocking fee on all returned parts. There is no returns on custom parts. 5 All other warranties we be a case by case basis. There is no warranty on nitrous, racing, pullers, supercharger or turbocharger equipped engines or parts. 6 There is absolutely no warranty on flat tappet camshafts or lifters. We don’t have problems with flat tappet cams, but a lot of people are. If you are worried about this please buy the hydraulic roller cam upgrade. We do not warranty leaks. 7 If the Customer believes that they have received a defective part or engine from BHP, the Customer must send the parts back to BHP (at the Customer’s expense insured) to be inspected. BHP will then determine whether the part failed due to defective materials or workmanship. There is no warranty on disassembled parts or engines. If BHP determines that the part has failed due to defective materials or workmanship BHP will credit, replace or repair the part ONLY. BHP shall not provide any refunds in such circumstances. It is the responsibility of the Customer to inspect the parts carefully before use. 8 BHP will not in any way reimburse for shipping costs or mechanical fee to remove engine or parts. BHP does not warranty of any part for emissions or street use for any state. It is the Customer’s responsibility to comply with local and state laws. 9 No members or employees of BHP are personally guaranteeing any work being done. 10 It is understood that high performance engines may be used in competition or high performance events in which there is an elevated level of risk. The parties agree that under no circumstances shall BHP be liable for any consequential damages of any nature and that any liability of BHP shall be limited to any amounts paid to BHP, subject to warranty restrictions in this Agreement. In the event that any third party asserts any claim against BHP due to Customer’s use of the engine, Customer shall indemnify and hold BHP harmless from such claim, and shall indemnify BHP for its legal expense. 11 Any engine or parts left with BHP with a balance over 30 days will be assumed abandoned and may be sold to pay the any outstanding balance immediately. In addition, a 10% fee will be charged every month until paid off or until the engine is sold. 12 The parties agree that the work being performed is in the nature of bench work and does not constitute service of a motor vehicles under Michigan law. As such, the services to be performed are not subject to Michigan laws regarding the service of motor vehicles. 13 Any claim for breach of this contract shall be brought in Clinton County, Michigan. This contract shall be interpreted under the laws of the State of Michigan. The Customer acknowledges that he or she has read and understood the Contract above in its entirety and agrees to be bound by its terms.